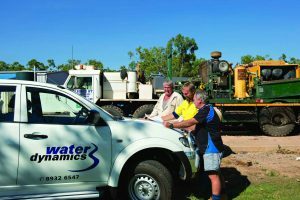 Water Dynamics’ design and supply capabilities are supported by experienced irrigation installation teams. Our portfolio of irrigation installations across the country, ensures we provide a premium installation service, guaranteeing optimum performance and longevity of your irrigation system. We install all types of irrigation systems across all industries. The headworks, including pumps, water meters and filtration. The mainline, which transfers the water from the headworks to the irrigation zone, can be over 5kms long. Internal pipework, including sub mains and flushing mains provide the last point of connection to the irrigation delivery system. knowledge and service right through to this final stage. Planning is important for the installation program. It is essential that the installation is scheduled to be completed on time and well before the system is required to be used. The installation must always follow the irrigation design, ensuring that installation best practice is followed. Our installers follow the system designs while proactively addressing any issues that arise during the install. 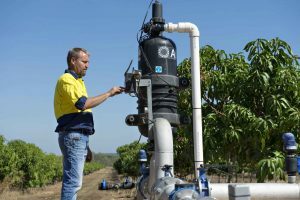 Water Dynamics has been building and commissioning T-L centre pivots and linear irrigators for over 30 years and has installed over 1,000 centre pivots across Australia. Every T-L installation is unique, depending on the number of spans, the topography of the land, the crop being irrigated and the conditions on the day of installation. With each span being up to 4m off the ground and up to 60m in length, pivot installations are demanding. We protect your investment with an experienced and highly skilled installation team. Our irrigation teams are also able to install small and large irrigation projects in the home and garden. We specialise in all types of sprinkler irrigation installations, including pop-ups and micro sprinklers. We provide a very simple 2 step process to our residential customers. Using your specifications our staff will develop a product list for your irrigation system and will provide you with a detailed quote. Once you have approved the quote, our team will come out to perform the installation. 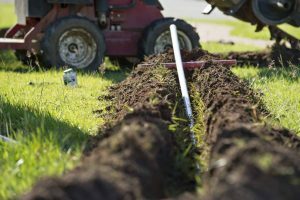 Our team of irrigation experts will first mark out the site and conduct dial before you dig assessments before conducting the installation. The whole installation process only takes up to 2 days to complete so you can enjoy the convenience of your new irrigation system in the quickest time possible. For help with your irrigation installation call us on 1800 571 812.